The hydraulic devices in hydraulics engineering are the devices that use liquids to transmit pressure equally from one point to another. In many Hydraulic Devices, Bernoulli’s Equation has widely applied. It is used for derivation of many Engineering Formulas also. Hence In this post, I will cover its Application on the three Main Hydraulic Devices. 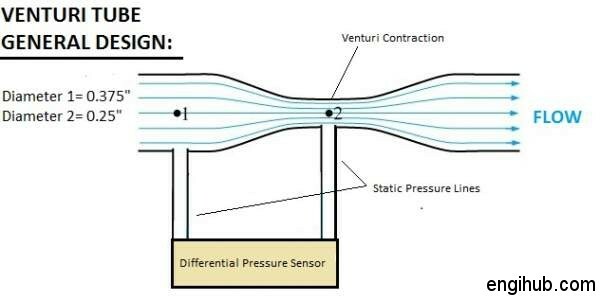 The Venturi meter is an apparatus, for finding out the Discharge of a Liquid Flowing through a pipe. It is the short pipe which converges from Diameter d1 to a smaller Diameter d2. It is also known as “Inlet” of venturi meter. The slope of Converging sides is between 1 in 4 or 1 in 5. It is a small portion of the circular pipe, in which the Diameter d2 is kept constant. It is a pipe, which Diverges from Diameter d2 to a large Diameter d1. It is also known as “Outlet” of the Venturi meter. This is used to measure the Discharge in a pipe. This Plate is fixed inside the pipe. Also, a Mercury Manometer is inserted to know the difference of Pressure between the pipe and the Orifice. It is the instrument to determine the Velocity of Flow at the required point in a pipe or stream. Hence Pitot tube consists of a glass Tube bent through 90 degrees. The lower end of the Tube faces the direction of Flow. So, the Liquid rises up in the tube to the Pressure exerted by the Flowing Liquid. By measuring the rise of a Liquid in the Tube, we can find out, the Velocity of the Liquid Flow. I hope this information will help you in better understanding Hydraulic Devices.